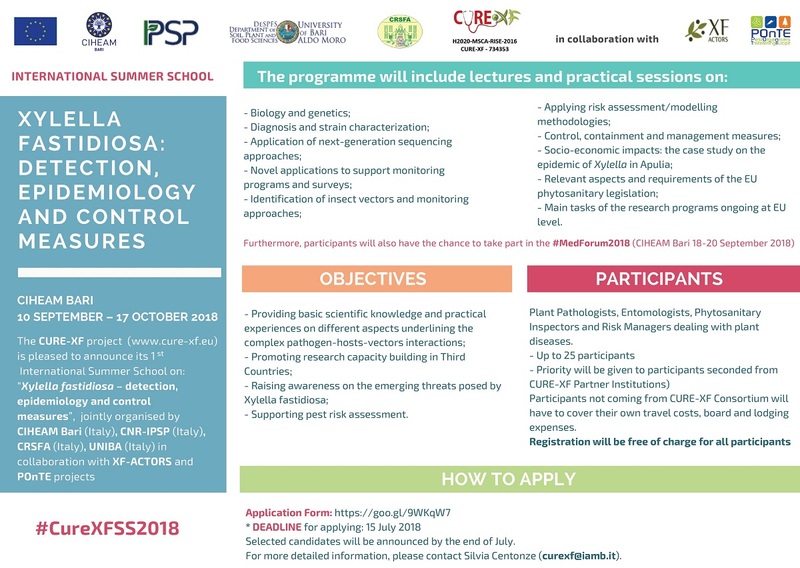 From 10 September to 12 October 2018, the CURE-XF project is organising its 1st International Summer School on: “Xylella fastidiosa – detection, epidemiology and control measures”. The Summer School is divided in 4 sessions and will take place mainly at CIHEAM Bari premises, in the region of Apulia, Italy. The School is free of charge. The Summer School is jointly organised by CIHEAM Bari (Italy), CNR-IPSP (Italy), CRSFA (Italy), UNIBA (Italy) in collaboration with XF-ACTORS and POnTE projects. – Support pest risk assessment. The official hashtag is #CUREXFSS2018. Plant Pathologists, Entomologists, Phytosanitary Inspectors and Risk Managers dealing with plant diseases. Up to 25: priority will be given to participants seconded from CURE-XF Partner Institutions, but participation of trainees external to the Consortium will be welcome. The course will take place from 10 September to 17 October 2017 mainly at CIHEAM Bari and at the premises of the four organizing partners, according to the activities to be carried out. Registration will be free of charge for all participants. Travel, board and lodging costs of the CURE-XF seconded staff participating in the school will be covered by the project according to the H2020-MSCA-RISE-2016 rules. Participants not coming from the CURE-XF Consortium will have to cover their own travel costs and board & lodging expenses. Selected candidates will be announced by the end of July. For more detailed information, please contact Silvia Centonze (curexf@iamb.it). • financial support justification (only for participants not coming from the CURE-XF Consortium).